Is “one, two, many” a myth? The “one, two, many” theory is that cultures developed words for “one” and “two” before anything else, and any numbers after are referred to as “many”. Do cultures with a one, two, many system exist? In tests, the children were asked to put out counters that matched the number of sounds made by banging two sticks together. Thus, said Butterworth, they had to mentally link numbers in sounds and in actions, which meant they couldn’t rely on sights or sounds alone. The Pirahã of the Amazon have been cited as a using a “one-two-many” system of counting. They are truly an extraordinary case of a tribe, and if the (admittedly controversial) claims of the linguist Daniel L. Everett are true, they have no tense to describe things that are not physically present; hence they cannot talk about the future nor tell stories about the past, nor name exact abstractions (like colors). Consider the cardinal words versus the ordinal words in English (if you ever mix them up, ordinal numbers referring to the order things are in). While the words are initially mismatched (indicating that “first” and “second” were developed separately from the abstract notions of the numbers “one” and “two”) after three the words match linguistically. and in many other languages. So there is some circumstantial support to the content that “one” and “two” have some special significance, although the same evidence could as easily be used to claim the ordering of “first” and “second” was the real first development, and the cardinal numbers were instead developed all at once (or at least up to five). While these tribes developed words to count past 2, the linguistic evidence demonstrates they started with the words for “one” and “two” before the later numbers. 1. Cultures exist with only words for one, two, and many. This isn’t a myth, as already explained above. 2. It’s common for cultures to have only words for one, two, and many. 3. Every strand of counting development started with a one, two, many system. This one’s a touch foggier — there’s historical evidence that one and two were special in the development of language, and arguably cultures that started with counting up to five or ten simply were using received knowledge from cultures that went through the entire development process. 1 The situation is slightly more complicated than Blake claims. For example, the Anindilyakwa mentioned in the study above usually only use words for one, two, and many, (and the children involved in the study only knew those words) but also have rarely used words for up to 19 for rituals. 2 The idea of “six apples” can be understood without fully abstracting the number “six”. In the Tsimshian language there are separate number words for flat objects, round objects, men, long objects, and canoes. Very interesting, it’s amazing that two so close concepts can have evolved separately. Thanks for the typo snagging. Jason, thanks for such a well-planned and thoughtful response. I am most struck by the study of Australian aboriginals ways ways of reasoning quantitatively. It forces me to think about the way a teacher necessarily imposes a particular cultural artifact (in this case, “mathematics”, or maybe “school mathematics”) on young minds. And that it is an explicit purpose to ensure our children/students think in certain ways… So I don’t sound too over the top, I find Dewey’s Child and the Curriculum http://bit.ly/dcX3Oe to be a great way to think through the balance of adult ways of knowing mathematics and the student’s mathematical mind. That looks like adding 1s and 2s, not base 2. As English (root vocab Germanic) and Spanish (romance) are both Indo-European languages, I would not want to generalize. Likewise odin, dva (1,2) in Russian don’t match pjerviy, vtoroj (first, second), but in non-IE Turkish, bir, iki match birinci, ikinci. I wonder how much variety there is. True (I am following the terminology of my texts, but I should probably fix that to something more sensical). This is “one, two, many”; A Lie. Aboriginal people almost universally across the continent and surrounding islands counted by the base of five. Their method granted accuracy in enumerating into the hundreds or even thousands if or when necessary. It is linguistically and intuitively very different from the western system (which was inherited off ancient Indians who are ethnically linked to Aboriginals and then Arabs of the Islamic Empire). In many language groups proper tag words existed for the multiples of five (5, 10, 15, 20, 25… 100 etc) leading right up to words reported for 1,000 in places like the Torres Strait Islands. Unfortunately the anthropology conducted in these times was racially motivated ethnography and actively sought to prove some human groups to be “less than modern”. 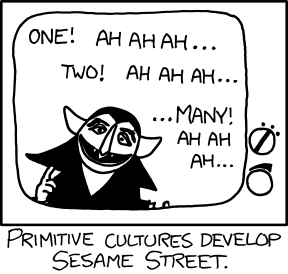 It was this bias that saw most of the anthropologists of this time completely dismiss this method of counting for a lack of unique tag words for each number even though compounds (two and one= 3 for example) work just as well in their place and only petty ethno-semantics and old world racism could convince you otherwise. “How many fingers do you have on your hand?” seemed like such a stupid question to them but they answered anyway and held up their hand, “hand” being the word for 5 in most language groups across Australia. The stupidity was on the side of the ethnographer not the Aboriginals. LOL!!! Idiots. The fact that modern desert “full bloods” grasp western mathematics now show the entire point was moot in the first place. Culture is king and if your culture has no need for the abstract science of maths it won’t discover it. As it was Europeans only took the germ of modern maths home with them as booty after the Crusades. And if counting based in 1’s and 2’s seems primitive to you then adding 8 more is all that separates us and the stone age. But you also might want to look into African sand divination which was used scratched in the dirt as a kind of ancient random number generator using 1’s and 2’s to predict the future of conduct religious ceremonies or whatever. The Arab mystics recorded this and eventually it was passed on to Europeans. It took a few thousand years but Gottfried Wilhelm Leibniz finally changed the 1’s and 2’s to 0’s and 1’s which led to the binary code which is used in the computer you’re reading this on. I agree a great deal of research on the topic has been confused in exactly the manner you state, although I am unsure you actually read the article above, or watched the video, or read the article regarding the study I linked to with the Warlpiri and Anindilyakwa. I would say the case with the Pirahã is still open. Never, meaning not ever have I read a more jaded account of the mathematical, not to mention geometry and science physics of any race of people on earth. Just a bit of trivia, the Australian Aboriginals are the originators of all mathematics and applied sciences. The entire subject bridges time and without doubt walked with two legs and was imparted from one to the other. For these people this knowledge is intertwined into their daily lives. Its like eating and breathing, so familiar are they with the practice, it takes little thought. They cannot translate for you. On this subject matter the Europeans have missed the boat. If the writer of this blog has the rest of his or her lifetime to devote to this subject, for it would take that long, I would suggest the writer either give up or go the hard yards to get the facts correct. The saying, ignorance is bliss is not funny, its fueling a debate of woefull misconception. I just wanted to say a massive “kudos” for this well thought-out and clearly-motivated work. Well done! Keep the great content coming.